I'll be honest, the creator in me must be on hiatus. I went into my sewing room last night with good intentions to make something. But, I ended up on the couch and watched a dog show of all things. But then I came across this in the Pottery Barn catalog. Isn't it clever? And most certainly doable to make one on your own. Then a little firework went off in my head and I remembered the white platter I just bought from TJ MAXX on clearance for $8! 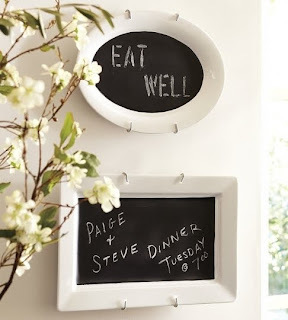 Buh-bye slump, helloooo chalkboard paint. Like a just mentioned, I purchased this adorable platter on clearance for $8. But, surely, you could probably find one of these at a thrift store for less. You'll also need painters or masking tape, newspaper, and a can of chalkboard spray paint. First, tape around the area you want to be covered with chalkboard. Then, cover the white ceramic border with newspaper. Tape it in place. This is going to keep the white parts white, so unless you've got mad spray painting skills, don't skip this step. Spray paint away. Call me paranoid, but I let mine dry for 24 hours before I peeled the paint. And, ta-da! A nice little goodie for you to write love notes, grocery lists, inspiration, or stick figures. And, it's easy, too! Just a little note, and a lesson I learned the hard way, don't use clay sidewalk chalk. It scratches the surface and you'll have to repaint. I've GOT to give a shout out to Elizabeth who is going live today with her new website called "To Be Charmed." She posts some great inspiration. Show some love and visit her here. Good luck Elizabeth! P.S. I take the worst tutorial photos ever. If any of you have tips on what I can do to make them better, I'd so appreciate the help. I love knock off posts! Great idea! That is such a cute idea! Where did you get that really cute plate stand from? I did this knock off a month ao and noticed my chalk scratched the surface. Which chalk did you end up getting that wont do this? Only use a calcium carbonate chalk. this is a good idea, thanks for sharing! p.s has anyone ever maya rudolf from snl? Also, thank you so much for the blog love it's greatly appreciated. This is an adorable project! Thanks for the tip Emily for only using Calcium Carbonate chalk, that is a good thing to know! This is such a great idea! I think I will do this in my kitchen! You are so creative, I just love it! Does it need to be a certain type of plate? That is so cute! I'm going to make one as a gift for my daughter's kitchen. Thanks for the inspiration! So awesome!!! what a great (& easy) idea! Thanks for sharing...great idea! I am loving chalkboard paint..endless possiblilites! I tried painting a ceramic plate but the chalkboard paint peeled off> It was "paint on" kind rather than spray paint. Have you had any trouble with the chalkboard paint coming off? I love this Idea!!!! I have chalkboard paint left over from when I spray painted plastic eggs for my nephews.......I found that you need to buff the chalkboard paint after it drys so the chalk doesn't scratch off. I have a wonderful white plate I bought in a thrift shop that will be perfect for this. Thanks for the Idea!!! This is great, and I'm trying it today.